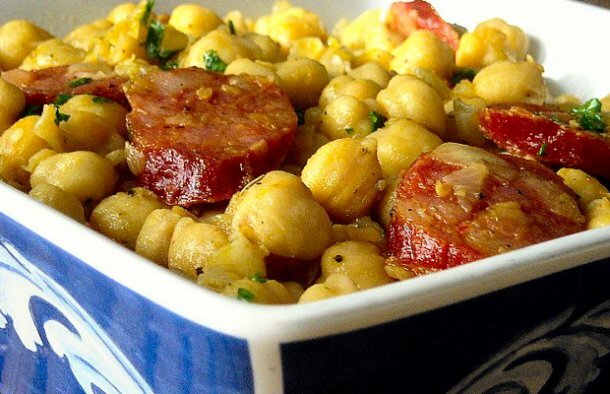 This Portuguese chickpeas with chouriço recipe is easy to prepare, it's delicious and makes a great meal for two. In a large saucepan, add the chickpeas, the bay leaf, cloves, chicken stock cube and add enough water to cover all the ingredients and bring to a boil (if you are using uncooked chickpeas, cook for about an hour). Drain the chickpeas, discard the bay leaf and cloves. In a large skillet with some olive oil, add the onion and cook until translucent. Add the garlic, a little dry thyme and raise the temperature . Add the chouriço ​​and cook for about 2 to 3 minutes or until the chouriço ​​is cooked. Add the chickpeas to the frying pan and mix well. Season with salt and pepper, sprinkle with some chopped parsley and remove from the heat. 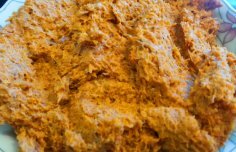 This Azores style pork spread (pe de torresmo) is delicious on fresh bread, a bun or some toast. 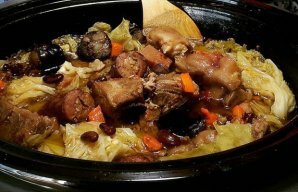 Feijoada originated around the 14th century in the Northern region of Portugal. Normally, it is made with white beans but in some regions, red kidney beans are used. This dish is best served with Portuguese rice and Portuguese Bread. 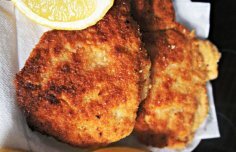 A Portuguese dish that is very popular because of its unbelievable flavor and crispy texture.